This past weekend the Philadelphia Inquirer’s John Timpane wrote a story about Ardrossan, the last of the great Main Line estates. At its peak, this stunner was a true estate on par with European royal properties, an 800-acre property centered around a 50-room, 33,000-square-foot mansion designed by Horace Trumbauer. Completed in 1912 for the Montgomery/Scott/Wheeler family, the house and property are still home to family members. 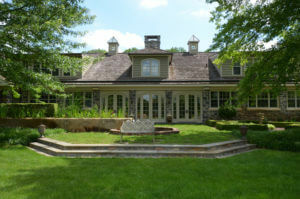 However, as the Inquirer story points out, the family trusts that govern this Georgian-Revival-style manor run out in 2021. The fate of the main residence is unknown. In some ways, the estate has already moved into the modern era, carving off acreage for development in a subdivision effort that is overseen by the family. In the past 10 years, a limited number of building lots on the estate have hit the market: .75-acre lots in the “Ivy Lane” area for those who want a village setting and 10-acre lots in the “Hidden Valley” section. But arguably more special than any of these spots is a section of the estate that was carved out early on, and that is known as Albermarle. Albermarle was the site of Ardrossan’s stables, but now it’s a magnificent estate compound on 16.93 acres. There simply is no other part of Ardrossan like it, and it’s now on the market seeking a buyer. Very private with exquisitely landscaped and hardscaped grounds, the estate contains a main residence; Clock Tower offices ideal for C-level executives, entrepreneurs or anyone who needs work/conference room space; two guest houses and a fantastic party barn and pool. The property is walkable to Overbrook Golf Course & Country Club. The quality of the restoration completed at every building on the Albermarle property is top of the line – every inch of mortar and stone has been cleaned and repointed. Expert craftsman worked inside and out to create comfortable, beautifully appointed living spaces and character-filled, “Class A” office space in the clock tower building. The guest houses have been renovated and have complete accommodations with full kitchens and baths. The party barn fits perfectly at this formerly agricultural property. Inside, it has a game area on the first floor and fitness area on the second level. The view from the treadmill is pretty unbeatable! To live on any part of Ardrossan’s 800 acres is a privilege; to be the owner of Albermarle is to have an original piece of the estate’s history, now fine-tuned for modern needs. See a video and property details on the property here. For more information about this offering, please contact Lisa Yakulis: 610.517.8445. For a more complete history of Ardrossan, order a copy of David Nelson Wren’s book, Ardrossan: The Last Great Estate on the Philadelphia Main Line (Bauer and Dean, $75).